Upon your arrival to Dubrovnik you will be received, welcomed and escorted to your hotel by our private driver. Afternoon at leisure. A coastal drive south to the picturesque seaside town of Cavtat, where you'll walk the limestone cobbled streets, squares, promenade and see the villas and houses and hear all about the local history & customs while having a drink at one of the many street side cafes. Cavtat was directly affected in the early 1990's war and you'll hear all about that period. After Cavtat you'll drive back towards Dubrovnik making a slight detour to the Srdj hill top which overlooks Dubrovnik the coastline and nearby islands. You'll then drive down to Dubrovnik's old town for a full tour seeing all the sights. The tour starts with a coastal drive along the Peljesac peninsula to the town of Orebic where you'll take a boat over to the Island of Korcula, the birth place of Marco Polo! You'll be led on a walking tour hearing about the local history and loads of interesting tid bits. After free time you'll head back to the Peljesac peninsula to the medieval walled town of Ston. It's walls were built in the 16th century and at that time were the second longest defense walls in the world after the Great Wall of China! You can walk part of the walls, see the ancient Roman salt flats and stroll through the cobbled streets of the town. Ston is the oyster and mussels capital of Croatia and the restaurants & taverns specialize in the local cuisine and predominate zinfandel wines.There are excellent local taverns along the way where you can try the local cuisine. Tour starts by taking the coastal and inland roads to Mostar in neighboring Bosnia & Herzegovina. After crossing the Croatian / Bosnia & Herzegovinian border you'll get a full run down of the country, hear all about the local history and life in the present, break up of Yugoslavia and the early 1990's war. Mostar is known for it's mix of Ottoman & Christian architecture, maze of cobbled streets, street side cafes, taverns, mosques, churches and it's famous 16th century Old Bridge which crosses the Neretva River. Mostar was directly affected in the 1993 war and many of the buildings still pay testimony to that period, although nowadays is very safe and increasingly popular. The cuisine in Mostar has a distinct oriental influence like different kebabs, finger shaped ground meat balls called Cevapi, baclavas, Turkish coffee and more. 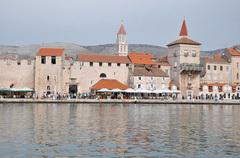 The tour starts with a 30 min coastal drive to the UNESCO Island town of Trogir, where you'll walk the cobbled streets, squares, seaside promenade and see the 13th century cathedral of St. Lawrence, the 16th century Venetian Kamerlengo fort, medieval Renaissance palaces, local limestone houses and more. 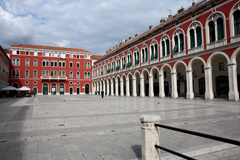 After experiencing Trogir and hearing about the local history, customs and trivialities you'll go back to Split for a full walking tour of Diocletian's Palace and the rest of the medieval part known as the 'Old Town'. After the tour you'll have free time to explore on your own, do some shopping and indulge in the local cuisine. 2 hour ferry ride from Split to the port of Stari Grad, Hvar where it's a 25 min drive to the town of Hvar. Upon arrival to the town of Hvar you'll be taken on a walking tour seeing all the sights and gain a better understanding of the history and present day island life and see why Hvar is a must see. Hvar has a maze of cobbled streets, scenic coastal walkways, beaches and countless outdoor cafes perfect for 'people watching'. One of Hvar's best vistas is from the Spanjola fort which overlooks the town. After taking in the local atmosphere you'll see more of the island by driving by the lavender fields, vineyards & olive groves, and visiting the seaside & inland villages. There are numerous lunch options at taverns and family run homesteads and ample places for photo vistas and wine tasting. Morning departure from Split taking the A1 highway and with commentary along the way about the history, customs and local trivialities of the areas you drive through. Free time to explore the park seeing the flora & fauna and best vistas. Morning at leisure and check -out from hotel. Transfer to airport for your onward flight to next destination.